The Marshall Memorial Fellowship (MMF) is the flagship leadership development program for German Marshall Fund of the United States, granting fellowship awards to the leaders from all sectors, including business, government, and civil society. Fellows engage in 6 months of preparation designed to enhance their understanding of transatlantic relations before embarking on 24 days of immersion. Created in 1982 to introduce a new generation of European leaders to the United States, the MMF program grew in 1999 when it began sending leaders from the United States to Europe. Today, GMF selects fellows from all 50 U.S. states and across 39 European countries. The MMF alumni network numbers nearly 2,500 leaders, including fellow California wine industry representative Allison Jordan, Executive Director of California Sustainable Winegrowing Alliance and also Wine Institute’s Vice President of Environmental Affairs, who went through the program in 2001 and nominated Kruse for this Fellowship. Kruse was selected from more than 700 nominations across 39 countries. The 2015-16 Marshall Memorial Fellow class includes 42 individuals from Europe and 34 from the United States. This new class of fellows represents 21 European countries and 17 U.S. states. Kruse will participate in the fall program from September 30 to October 25, 2015. 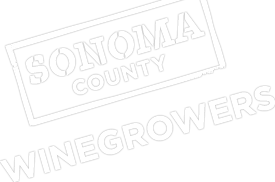 Kruse, who was named president of Sonoma County Winegrowers in 2013, has been instrumental in guiding the organization to a leadership role in the wine industry on sustainable winegrowing. In 2014, Kruse announced on behalf of the Sonoma County Winegrowers and Sonoma County Vintners that the region was committed to becoming the nation’s first 100% sustainable wine region by 2019. While this was considered by many throughout the global wine industry to be an audacious goal, Sonoma County grape growers and winemakers championed the commitment to sustainability. The local wine industry has long been at the forefront of creating and utilizing sustainable practices in the vineyard, in the winery and in running their businesses. Today, nearly 50% of all vineyard acres in Sonoma County have completed a sustainability assessment and are either certified sustainable or going through the certification process. This progress is far ahead of expectations indicating the strong commitment of the local wine industry. With research indicating that more and more consumers are looking for wines grown and made sustainably, other wine counties and regions have recently followed Sonoma County’s lead to become sustainable in the years to come. “We are elated to have Karissa Kruse represent Northern California and our very own Sonoma County as a Marshall Memorial Fellow. Karissa’s leadership for the winegrape industry, and especially in leading the 100% Sustainable initiative puts her in a perfect position to share her knowledge overseas as well as bring innovations back home,” said James Gore, 4th District Supervisor for Sonoma County. Kruse earned a BS in Economics and an MBA in Marketing from Wharton School of Business at University of Pennsylvania. She has over 17 years of experience in various aspects of marketing, brand management, strategic planning and business development. Karissa has worked for companies such as General Mills, Universal Studios, Mattel and Dairy Management, where Karissa worked for seven years on behalf of dairy farmers nationally. She is a partner in a small winery, Argot Wines, with a 5-acre vineyard on Sonoma Mountain. Kruse is on the Advisory Committee for Wharton’s Initiative on Environmental Leadership and on the boards of the Sonoma County Tourism, Sonoma County Harvest Fair, Sonoma County Grape Growers Foundation, Santa Rosa Chamber of Commerce, Santa Rosa Junior College Shone Farm Foundation, Ag Trust Committee and Viticulture Advisory Committee and a member of Leadership Santa Rosa Class 29. Kruse was selected as a NBBJ Women in Business 2014 Honoree and 40 under Forty Award recipient in 2012.